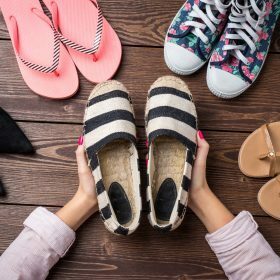 Originated in the country of Spain, women's espadrilles have always been around, but only a few years back the international fashion scene discovered them. And we're glad it did! Because there is actually no other perfectly comfortable made shoe around for the summer days. Women's espadrilles can be styled with summer dresses, maxi skirts and cute tops in summer. The original, wedge or mules, you can choose your favourite picks. Use the filters to find your favourite colours and materials!